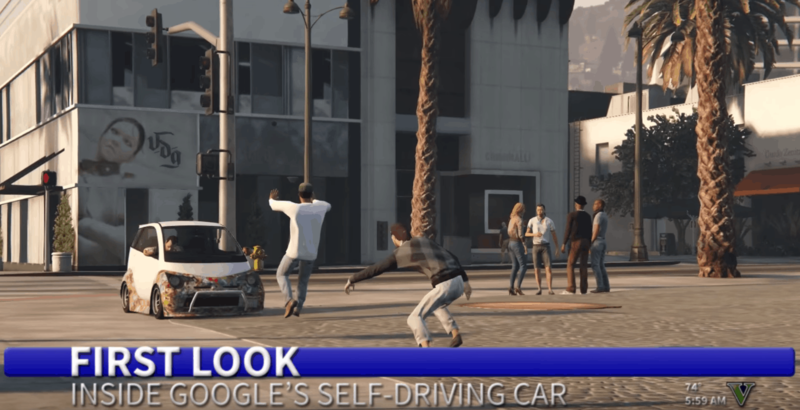 Created in GTA V’s amazing editor mode, which lets you create your own movies inside its fictional world, the ad demonstrates which could happen (maybe) if Google’s self-driving car suddenly went crazy. Before watching the clip — which is just brilliant — note that people do get run over, but they are only video game characters, and it’s not too graphic. If that’s not the best use of GTA V’s movie editor yet, then I don’t know what is. While it seems highly unlikely a self-driving car would go on a rampage all by itself, it could, theoretically, be hacked by a madman. That’s one of the biggest concerns about smart cars that can be controlled remotely by smartphones and watches. Last July, Wired reported how a hacker was able to remotely kill a Jeep Cherokee while it traveled at 70 mph on a highway. Using special software, they were able to send commands to the vehicle to control its brakes, transmission, steering, and more. As smart cars become more popular, this becomes even more worrying. However, the U.S. has already proposed plans to make vehicle hacking illegal, with penalties of up to $100,000 for those who are found guilty.